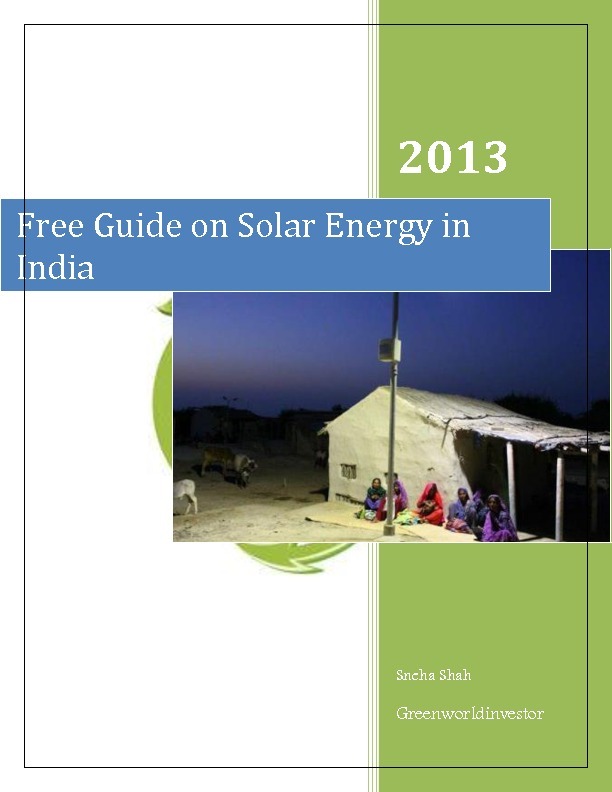 After the success of the previous publication “Solar Panel Buyer’s Guide” from Greenworldinvestor, we have launched our new “Free guide on Solar Energy in India” ebook. This eBook covers all aspects of Solar Energy in India right from how to buy a solar panel, how to build a solar power plant to the future of solar industry in the country. 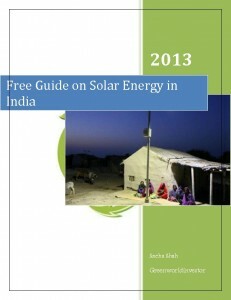 This book throws light on the various central and state subsidy schemes in India. This book contains handy information regarding supplier details of various solar products from Solar Panels, Solar Inverters to Solar Lights. Simply fill in the details below and we will email the ebook to your registered email id in Pdf format. We will ensure the confidentiality of all your personal details. I hope this will help me in my Solar Project. I am interested in Installing a 1MWp Grid-connected solar power plant in village rapri, dist-yamunanagar, haryana. My plan is to sell the electricity to the government. It would be really kind if you guide me with the estimated investment required in the project along with the subsidies that i am gonna get from the central and the state government.and which bank have provided lone for this project. 2MW-20MW solar PV Projects under Pen access with attractive 3rd party PPAs are available for Investment in Karnataka,Telengana states of India. Also State Governments like Andhra Pradesh, (500 MW)Karnataka, (500 MW) Telengana(500 MW) have released Project Bid documents..
Pls help me as the pannel type and which panel produced more energy pls,,,. if i install 1 mw solar power plant in gujarat. government of gujarat will purchase energy from me ? Gujaraat has ample electricity i am not sure if they will purchase from a small plant. Depends on the location where u are located. sir please tell me about how to improve solar power generation ? I am interested in Installing a 1MWp Grid-connected solar power plant in Gondia (Maharashtra ). My plan is to sell the electricity to the government. It would be really kind if you guide me with the estimated investment required in the project along with the subsidies that i am gonna get from the central and the state government.and which bank have provided lone for this project. I am interested to know how much solar energy in mega watts can be generated on a 200 acre land. Estimation of the total investment to setup the solar power plant and if you can provide potential investors to invest in our project. Project location is Kanpur, Uttarpradesh. Intention to sell the electricity to government. You can write to me @ eskol1977@gmail.com.